View of Robert and Lewis Allen Farm. 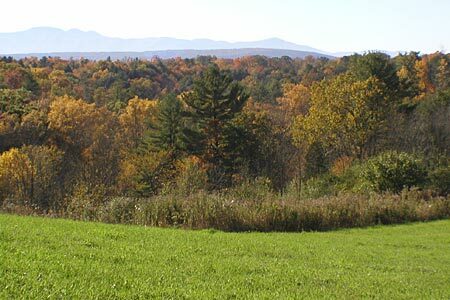 One of the largest farms in Scenic Hudson’s farmland priority areas, this property affords spectacular Catskills views and features a stunning mix of fields, hedgerows, steep ravines, woods and streams. More than 60 percent of the farm is either U.S. Department of Agriculture Prime Farmland or contains Soils of Statewide Significance. It currently produces hay, corn and other crops to support a dairy operation on the adjacent BBTT Farm, previously conserved by Scenic Hudson. Our purchase of development rights to this property is the third such transaction the farm's owners have engaged in, bringing to 440 acres the land preserved on this mainstay of Stuyvesant's agriculture-based economy. Since Scenic Hudson initiated plans to conserve a "critical mass" of working farms in the town in 2000, we've safeguarded more than 2,700 acres encompassing nine farms. Additional farmland in Stuyvesant has been preserved by the Columbia Land Conservancy, Open Space Institute and The Nature Conservancy. The purchase is part of Scenic Hudson’s collaborative campaign to Save the Land That Matters Most, protecting 65,000 acres of great scenic, ecological and agricultural significance.